Posh striker Lee Angol in action during the FA Cup win at Burton Albion. Photo: Joe Dent/theposh.com. The 21 year-old turned down the offer of a new contract at Kenilworth Road in the summer following frustration at the lack of playing opportunities at the club. Angol didn’t make a single first-team appearance for ‘The Hatters’ so there is an obvious point to prove when the teams meet at the ABAX Stadium early next month. But the joint Posh top scorer has more important things on his mind. A home league match with Fleetwood Town tomorrow (November 14) for a start. Angol said: “The FA Cup tie is obviously in my mind at the minute because it has only just been drawn. “But we have some important league games before then and it is important to build up some momentum before we start thinking about the FA Cup again. ‘To be honest I am not one for looking back. I’d rather look to the future. What happened at Luton is in the past. “It will be a tie I look forward to, but then I look forward to every game. “I am not looking any further ahead than Fleetwood for now. To get picked for the Luton game I will have to play well in the four League One matches before then. 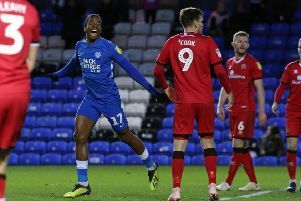 “I’ve enjoyed every minute at Peterborough United, but my form did dip after a very good start when I managed to score a few goals. “I feel like I’ve come through that though and I’m on the way back up again. Angol scored the last of his five goals when he was gifted an open goal at Swindon on October 12. That was a fifth goal in six matches, but he’d make no predictions about scoring against his old club in that second round FA Cup tie. “All I will say is that it should be a great game between two strong teams,” Angol added. “And there are so many links between the clubs it’s bound be a good build-up to the match. “We will fancy our chances as we are playing well and everyone is enjoying their football.